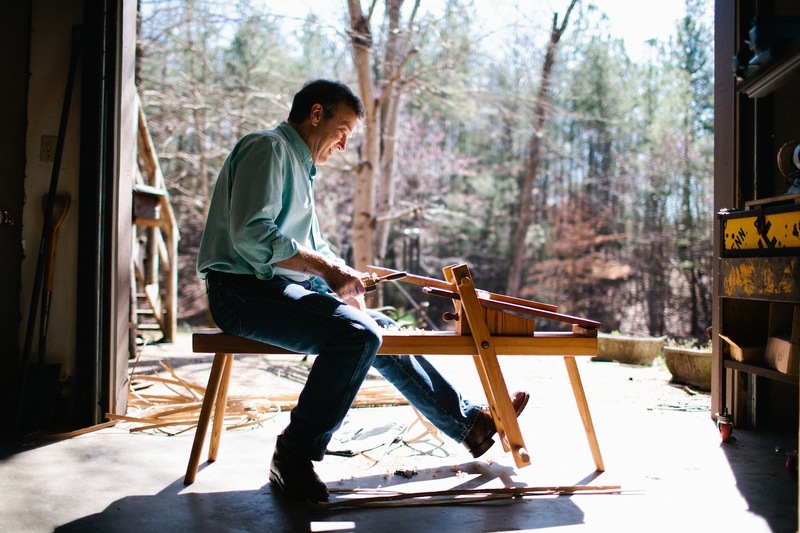 His path as a basket maker has ranged from weaving the sweetgrass baskets of South Carolina to New England black ash pack baskets and river cane from the Southern Highlands. Billy Ray has worked almost exclusively in recent years weaving traditional white oak styles, but since moving to Maine four years ago, he’s experimenting with new styles and materials. Suits an old dog well to learn new tricks. He is the former executive editor of WoodenBoat and Cooking Light magazines, and as a woodworker, he has built and restored custom furniture and wooden boats, including a 32-foot sailboat in which he cruised to and from Bermuda and the Caribbean. He now lives in Camden, Maine — but will always be a hillbilly at heart. Click Email to contact Billy. The following article appears in the June/July 2013 issue of Garden & Gun magazine. Click on the images for a high resolution pdf view. will add to this site in the future! Thanks, Jerry. I’m looking forward to sharing more about great basketmakers such as Leona. Their artistic gifts need support and appreciation. The nature of the weaver and the nature of the weaving reflect the strength, diversity, chaos, beauty and endurance of our natural world. Thank you. Hey, Billy. I remember the days when you were learning how to make the sweetgrass baskets! You’ve mastered the art/craft beautifully…everything here is gorgeous. Thanks, Karen. Sweet memories; I miss Charleston—and the days spent making baskets under the Angel Oak. The baskets are beautiful. Nice website. I will bookmark this and come back for more updates. Just surfing on company time, wondering what happened to one of my favorite editors… I knew you had talent but now I’m positively jealous. Great web presence, wonderful baskets. Billy Ray…..your talents have no end, apparently. Thanks for your kind words, Jan. Happy to make you a basket any time. Taught myself to do white oak baskets after my wife collected several during antique searchs in north Alabama. This was in the early eighties–still have a rotting shaving horse under a rotting shed. Time streams by and life overtakes us with its ups and downs. Like you, I found baskets an art form based on utiliiarian needs–art that infroms us best.. My wife also collected a number of country chairs with hickory bark seats worn slick and tough as steel. The chairs are engineering masterpieces of the minimal use of wood. Gum, red oak, and hickory bark. The rails were seasoned before inserting into the green gum stiles–no nails, screws, plugs or glue needed. Cancer got the wife in 98 but I still have her collection and forever grateful she opened my eyes to simple beauty. Mastered tools and wood very young–got scars from foot adzes and every wood working tool with an edge, but baskets was a most enjoyful side trip. Make art, baskets and don’t look back. Billy, I have read everything on your website and watched the video. It all kelp me glued to the pages and scenes. I especially liked the part about you and your dad visiting the old home place. I have to pause with the bragging and say that if it were not for your dad and many brave men like him, neither you nor I would have been able to live the wonderful life we have lived and lived exactly the way we chose to live it. He deserves everyone’s utmost respect. Hi Billy! I had lunch with Jennifer the other day and she gave me your website. Your baskets are just beautiful! After working at the Abbe Museum in Bar Harbor, and visiting our daughter in the Southwest, I have become enamored with baskets. I love their beauty, and historical context. When are you going to exhibit in Maine? Thanks for the kind words and appreciation for this special craft. I’ve heard great things about the Abbe, especially as a gateway to the Native American basket makers in Maine. I have a multimedia assignment to do on these basketmakers to complete this summer, and I’ll also be in the Rockland / North Haven area mid-summer on. Appreciate any leads or connections you might suggest. No plans to show, but I do have a couple of basket projects I will complete while in Maine. One of those, I hope, will show up in a gallery. My great grandfather was a locally known white oak basket maker. I have a few memories of sitting and watching him weave his baskets and they are so precious to me. He passed away when I was very young so I never got the opportunity to learn the craft from him. I’m hoping that my Dad and I can sometime soon try and make our own basket together. Wonderful, wonderful baskets you’ve made and a beautiful website.